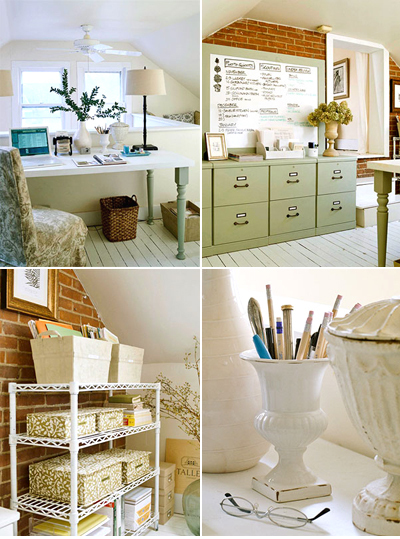 Somehow, I think home offices get overlooked when people want to decorate their homes. I think it's a combination of not wanting to have to think about another 'work space' besides your actual place of work (those that work from home, this does not apply to you) and that you don't want to invest in a home office since it's the last place you might want to put your money towards. Well, I've got news for you. The more efficient and organized your home office is, the better for you to get your bills, work, taxes, etc done. And it doesn't hurt if it looks good too. Why not make it pleasing to the eye so you don't dread having to use the space, no? There's a lot to talk about concerning home offices so I'm going to start off with some inspirational images that have started to make me think that I need to redesign/reorganize my own home office. Hopefully, it'll give you the kick in the pants you need too. Right now, my home office serves two purposes: as an extra guest bedroom and as the tech hub (wireless router, printer, monitor, cables galore) . It was originally going to be my home office but within the first week of trying it out, I decided that I needed more space. So now it has been designated as the conference call room if either my husband or I need to make a call. Of course it is used as an extra guest bedroom when we've got our friends staying the night, but something needs to be done to that room in order to make good use of that space full-time. The tech hub needs the most help since that is what's most distracting in there. Once we get that room completely decorated and organized, I'll post before & after photos for you all to see. Who says home offices can't be comfortable and cozy? Clearly they're wrong! The deep fuchsia chair on the right and the pink footstools look unquestionably plush. And what I can see of the chartreuse/mustard desk chair looks cushy as well. Home offices don't always have to be about work, it can be used for fun stuff too. It can serve as a workstation for all of your gift wrapping needs as seen in the photo above. One-stop-shop office. For small spaces, this is a great way to have all of your office needs in one place to create more room for other things. So clean and calm. I could see myself getting a lot done in a room like this. Plus, I'd be able to find any files of mine with a filing cabinet like that! I already feel chicer just looking at this photo. Imagine how much chicer you could be sitting at the desk? I love that the home office has been integrated into the living room seamlessly. Just based off this living room, I want this house. I don't even need to see the rest of it. I am loving the horizontal striped wall treatment they did. In all of the photos, each of the rooms have personal touches and that is something that you should NOT forget when decorating your own home office. That's what makes it more of a living space rather than the dismal office space people think of. You don't want to have a case of the Mondays every time you use your home office, now do you? Another item that you see in each of these photos are table lamps. Okay, okay except for the gift wrapping photo so almost all of them. But that is something that I will definitely want to talk about in a another post so I won't say anymore about them now. Lots to cover regarding the home office, so I'll leave you with just a few fresh takes on some basic office accessories until the next post where I will be covering more. How cute are these push pins? Très Chic! You can use the push pins above for this Daily System Linen Pinboard from Pottery Barn - $44.00. I just realized yesterday that I need to get a new calendar and what better one to get me going than this Linnea Riley Designed Calendar. Check out January's illustration - it's something that I desperately need to get as a poster (minus the calendar) so that I can hang it up in my kitchen. Maybe I should email Ms. Riley and ask her if she can do that since I can't seem to find that image anywhere just as a poster? Yea, I don't know about that. But it's worth a try I guess! Okay, I'm off to find more office accessories to share with you all!